Lea grew up in Southern California and has always been passionate about animals. She received her Bachelors of Science in Animal Science from University of California, Davis with an emphasis in Animal Behavior. The courses at U.C. Davis created a solid foundation of animal husbandry and introduced her to the fundamentals of operant conditioning. After graduating, Lea worked as a dog trainer, behaviorist, reptile specialist, and aquarist. 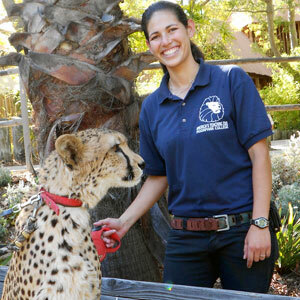 Lea enjoyed the challenges of working with more unusual species and moved back to southern California to continue her education, attending the Exotic Animal Training and Management (EATM) program at Moorpark College. While a student at EATM she learned how to care for exotic animals both physically and mentally, by providing those animals with proper nutrition and crucial enrichment. Now at the Wildlife Learning Center, Lea is eager to continue caring for wild animals and educating people on their impact on our environment and our everyday lives.